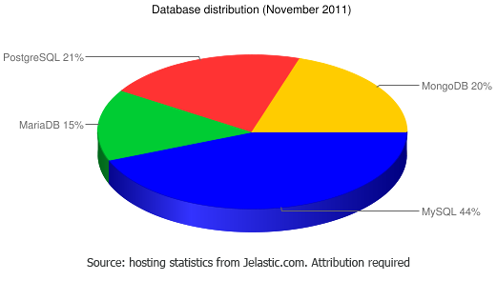 Jelastic is continuing to share with you data on the popularity of open-source databases among thousands of Java developers using our Java PaaS platform. A month ago we made a post on how the MySQL, MariaDB, PostgreSQL, MongoDB marketshares looked like in October – now let’s see what changed in November. MySQL is the leader far ahead of everyone else. PostgreSQL database has got the second place. MariaDB strengthens its position. MongoDB, which is our only NoSQL database for now, shows impressive results. Looking by regions, PostgreSQL has more fans in North America and MariaDB stays more popular in Europe (Jelastic is currently available from European and US datacenters). Looks like MySQL is slightly loosing the marketshare, with MariaDB and PostgreSQL gaining at its expense. Stay tuned to see the updated results next month!